My Dad's birthday was last week and I needed a birthday card for him and was participating in a masculine card swap. When I saw the new Spring Shades digital download, I knew that I wanted to use that paper for both. 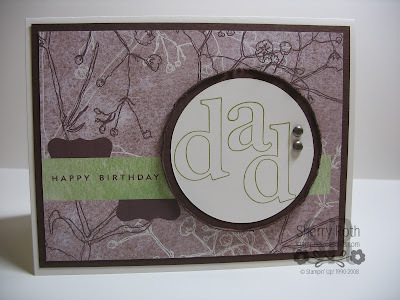 The first photo is of the MDS card front mounted on chocolate chip cardstock and then onto a whisper white card base. I loved it, but decided that for a swap, I really should add something so the next photo is what I ended up doing for the swap. I used the Circle Scissor Plus (112530) to cut a whisper white and chocolate circle. 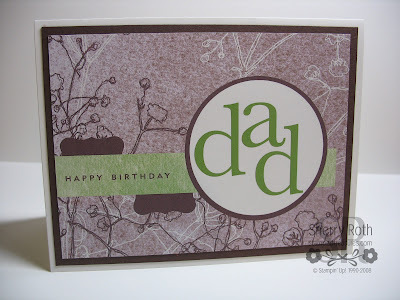 Then used the Jumbo Outline Alphabet (114998) and stamped the word dad onto the white. I added a couple vintage brads and then popped the whole thing up on dimensionals. 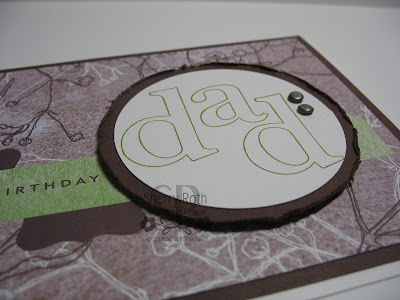 When I gave my Dad the card he actually commented on the feel of the card. I printed it on our Whisper White cardstock and it just feels so amazingly smooth but yet the paper has the look of texture. My Dad doesn't really comment on things like that so I was quite surprised.